Too bad it's not quite "D is for...." week, because mine would be for Denial. This is Honeybee, just 6 rows and a bind-off from being done. 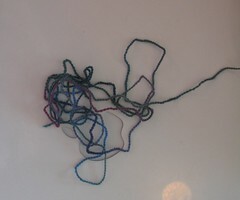 This is how much yarn I had left. I knew that, thanks to my loose knitting, I was going to be cutting it close. But after the miracle of more yarn, I had faith that there would be enough. Oh, well. I was apparently wrong. I've frogged back a little ways (thank god for lifelines!) and will be omitting one repeat of the Bee and Honeycomb section and a couple rows of the hem edging. 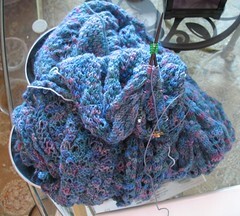 And then all that's left is blocking this 8-foot long shawl! 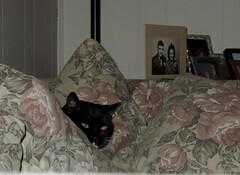 Dolly says, "I'll just be waiting here on the couch." DO IT DO IT DO IT DO IT DO IT!!! YOU CAN DO IT! Whoops... It sounds like it will be plenty long enough even without that repeat. And yikes to Dolly--that's got to be startling to sit on! I don't suppose it would be worth paging KnitSwap to see if anyone has a few dozen yards to spare???? It sounds like it'll be plenty big anyway..
drats! can't wait to see the finished prize! I can't imagine knitting 8 feet of anything! I believe that's what they call cutting it too close. I hate having to frog back.